This artist’s impression shows the closest known protoplanetary disk, around the star TW Hydrae in the huge constellation of Hydra (The Water Snake). Using the Atacama Large Millimeter/Submillimeter Array (ALMA), astronomers have discovered the organic molecule methyl alcohol (methanol) in the protoplanetary disk around the star TW Hydrae. This is the first such detection of the compound in a young planet-forming disk, and points to a region where comets are forming. Astronomers announced that they have found the organic molecule methyl alcohol, or methanol, in the TW Hydrae protoplanetary disk. This is the first such detection of this chemical compound in a young planet-forming disk. Because methanol forms on the icy coatings of small dust grains, this discovery provides a window into the region where comets likely are forming. “When looking at methanol vapor in the TW Hydrae disk, we’re probing the precursors of exo-comets,” says study co-author Karin Oberg of the Harvard-Smithsonian Center for Astrophysics (CfA). The protoplanetary disk around the young star TW Hydrae is the closest known example to Earth, at a distance of only about 175 light-years. As such, it is an ideal target for astronomers to study disks in detail. This system is about 10 million years old, and resembles how our solar system looked more than four billion years ago. The team made the detection using the Atacama Large Millimeter/Submillimeter Array (ALMA) – the most powerful observatory in existence for mapping the chemical composition and the distribution of cold gas in nearby disks. The ALMA observations have revealed the fingerprint of gaseous methyl alcohol, or methanol (CH3OH), in a protoplanetary disk for the first time. Methanol, a derivative of methane, is one of the largest complex organic (carbon-containing) molecules detected in disks to date. Identifying its presence represents a milestone for understanding how organic molecules are incorporated into nascent planets. Furthermore, methanol is itself a building block for more complex chemicals like amino acids and sugars. As a result, methanol plays a vital role in the creation of the rich organic chemistry needed for life. Gaseous methanol in a protoplanetary disc has a unique importance in astrochemistry. While other molecules detected in space are formed by gas-phase chemistry alone, or by a combination of both gas and solid-phase generation, methanol is a complex organic compound that is formed solely in the ice phase via surface reactions on dust grains. The observation of methanol in the gas phase implies that methanol formed on the disk’s icy grains and was subsequently vaporized. This first observation helps to clarify the puzzle of the methanol ice/gas transition, and more generally the chemical processes in astrophysical environments. 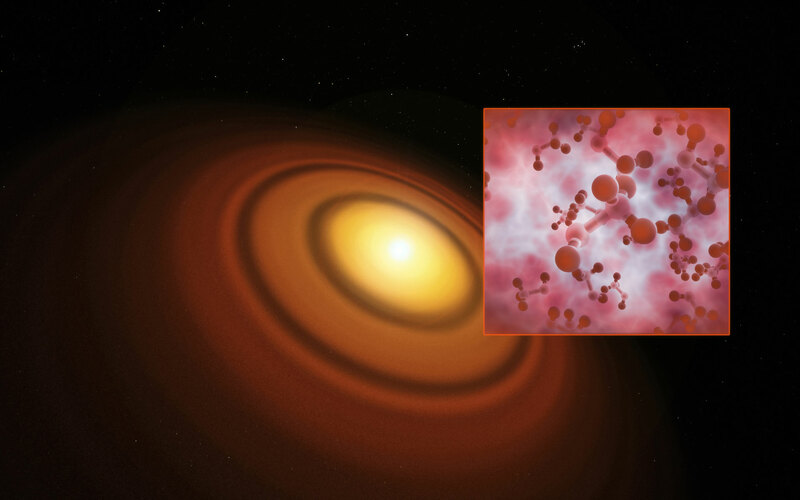 Be the first to comment on "ALMA Reveals Methanol in the TW Hydrae Protoplanetary Disk"